Intriguing storytelling and a fascinating fantasy world are built up in earthy detail in this novel. 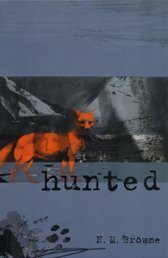 It starts with the awful beating given to Karen which leaves her in a coma but growing out of this, and running parallel to it, is the story of Karen's spirit emerging in a fox in a medieval fantasy world - a reminder of Fire, Bed and Bone in the narration and the physicality of the sensations. The fantasy is another rich vein of imagining where historic injustices must be righted amongst a community aware of the power of spirits and the presence of the girl within the fox.